I don’t know how often I will find feather drawings but I didn’t think this beautiful example should be included amongst the numerous bird drawings here on Reusable Art. After all, it’s not a bird, it’s just a single feather. So, here we go with the first vintage image for the feather drawings category. 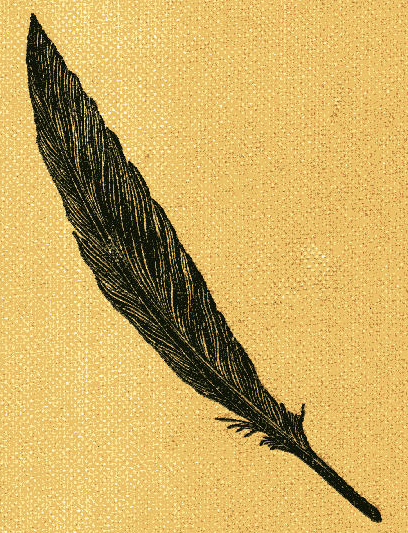 This black feather drawing was the cover image from a book published in 1912. The illustrator was Charles M. Relyea (1863–1932). Relyea was an American artist who’s work often appeared in magazines and novels. The rest of his drawings in The Man With the Black Feather were too story specific to really work here on Reusable Art, but I think this black feather drawing is great. Part of me wanted to remove the background pattern created by the fabric on the book cover but I think it could be useful for someone’s project, so I left it. Plus I like the look of the yellow woven background. It shouldn’t be too hard to remove all but the teeny bits of yellow in between the strands/fronds/(whatever the little sections are called) of the feather if you wanted to use the feather on a different background. The feather was drawn at a slightly jaunty angle and is done completely in black.